It should be obvious that the purpose of higher education is not an instrument of the state or of private enterprise to prepare students for employment. That is a beneficial outcome for students, employers, and society. And, of course, teaching can be greatly improved to better prepare students for work and for life. I have talked much about this in this blog. I have not talked as much about the fundamental purpose of a university, which is free and open inquiry in search of the truth; an activity pursued by faculty and students, and hopefully staff as well. It is difficult to succinctly describe how important this purpose is in relation to the advancement of all aspects of humanity. It is so important that one hopes that free and open inquiry in search of the truth goes beyond the confines of the university and penetrates deeply into the workplace and into one’s life. This purpose of a university generates valuable outcomes such as knowledge of a discipline, critical thinking, reading and numerical literacy, communication skills, intellectual curiosity, and so on. Yet, while we try to improve students capabilities in these and other areas, our efforts are often undone almost step for step by external influencers. In 15 years of teaching, I remain surprised and dismayed at the lack of critical inquiry that I have seen from students. Most of my students are working professionals, and it seems that the time spent between completing their undergraduate degree and beginning their graduate studies has allowed their critical thinking skills to atrophy, perhaps even damaging them severely. What is the culprit? The workplace, which includes influential managers at all levels as well as peers. Having worked in industry for 15 years prior to academia, I know well how a supervisor, mid-level manager, or executive can instantly shut down an inquiring mind. I also see more of that than I would like to see in university leadership, who is quick to blame others for problems, make excuses to deflect criticism, or make a questioner look stupid or uninformed to maintain control and reduce dissent. The hypocrisy is obvious. Unfortunately, we have many more role models for bad thinking than we have role models for good thinking. I try to help my students retain the desire and motivation for critical inquiry by using visual controls. Students create visual controls to remind them of key things they learned in class and are committed to apply. I also give students in each course I teach a visual control that I create for them to use. These visual controls have been successful at helping students remember and apply what they learned in my courses. Many students post the visual control in their cubicle at work and often get asked about it by other workers to whom they explain certain features of this visual control, thereby maintaining a connection to me and the course years later. (Here are two visual controls that you can use in support of your Lean teaching efforts). 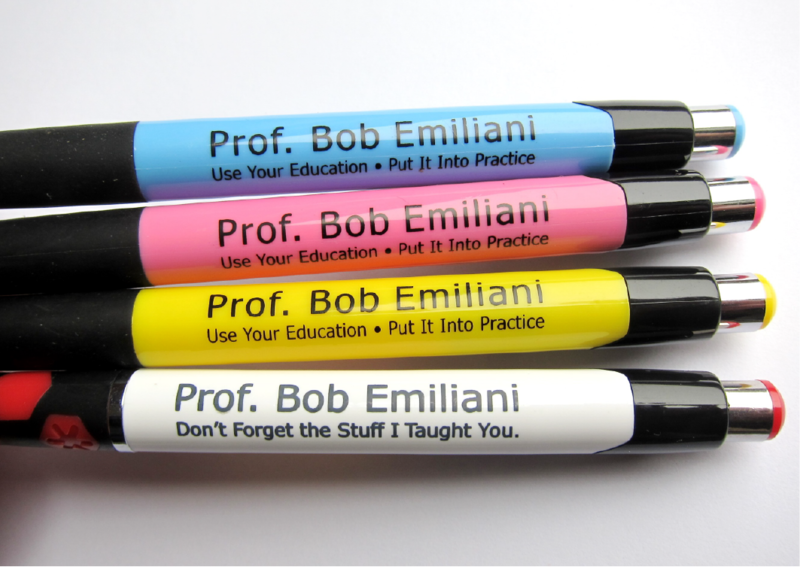 I also give to students (at my expense) a pen at the end of the course to further remind them of me, my teachings, and to apply what they learned. 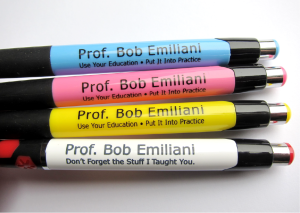 The first generation pen is shown at the bottom and says: “Don’t forget the stuff I taught you.” This too has been a big hit with students, and they often get asked about the pen by their colleagues. I think it helps achieve the desired outcome. A second generation pen is now available – in three colors! The new message is: Use your education. Put it into practice.” These words challenge students more broadly in their education than just my courses. I want to see students doing the best job they can, throughout their lives, of applying what they learned from as many courses as possible: knowledge of a discipline, critical thinking, reading and numerical literacy, communication skills, intellectual curiosity, and so on. But, I don’t want them to do that because I think everything learned in university is good or beneficial. Students will never know the quality of their education if they do not put it to use. By putting what they learn into use, they will find that some of the learnings work and some don’t. Some learnings work under all circumstances, some work under few or narrow circumstances, and some don’t work at all. By doing this, they will learn where they need more daily practice, additional formal education, or perhaps focused training obtained just-in-time to do a particular task. To the extent that higher ed exists to prepare students for employment, I wish that educators would take a greater interest in Lean management because organizations that practice Lean well carry forward our teachings into the real world. In particular, knowledge of a discipline, critical thinking, reading and numerical literacy, communication skills, intellectual curiosity, and teamwork. Progressive management is an elegant solution to the fundamental problems that all organizations face. Solving one problem simultaneously solves multiple other problems. Lean management is consistent in nearly every way with what we teach our students. Lean management is unique in that it requires managers to have the same discipline to good human relations and processes improvement that musicians have to music and performance – yet while creatively experimenting with new and better methods every day. Great Lean leaders are great teachers whom we should welcome as our most capable successors, in the never ending processing of education. In contrast, there is much to dislike about conventional management (what most faculty experience!) because, for example, one solution to a problem always generates multiple other problems. Another thing to dislike is the large variability in its practice by managers at different levels. It seems the majority of our students, the product of our labors, are cast into an intellectual desert, performing tasks assigned by their workplace supervisor with comparatively little opportunity to generate new ideas, create, and innovate. Leaders skilled in conventional management are terrible teachers and therefore our least capable successors. Managers who lack interest in critical inquiry influence their subordinates to do exactly the same. Lean management, done right, carries forward the essential outcomes of higher education and does so far more faithfully than conventional management. Lean management is good for our students both within higher education and outside of it.